A warning is only any good if it serves to alert us to an impending problem. The book of Revelation contains powerful warnings that in our day are so loud and obvious that only the blindly foolish could ignore them. In biblical times trumpets were mainly used to warn and announce. Chapter Eight of Revelation starts with seven angels each given a trumpet to sound as an urgent warning to the world. These warnings are of ecological and social disasters that are to come upon the natural world and its inhabitants. The first four effect the environment and the last two effect the minds and spirits of humanity. Numbers are used symbolically in Revelation and so one-third destruction described should be understood as signifying a substantial but lesser part of the whole. So, these are disasters that seriously impact the ecology yet do not entirely destroy it. Something else to bear in mind is that these disasters are warnings, not punishments. They are the results of human sin, not divine judgment. The intention is that mankind should consider what it is doing to the ecology and take sober warning from this. Genesis 2:15 records that ‘the Lord God took the man and put him in the Garden of Eden to work it and take care of it’, yet humans have forever polluted and destroyed the environment. Each succeeding generation has been responsible for a greater degree of environmental destruction, but in our day it has reached unprecedented levels. 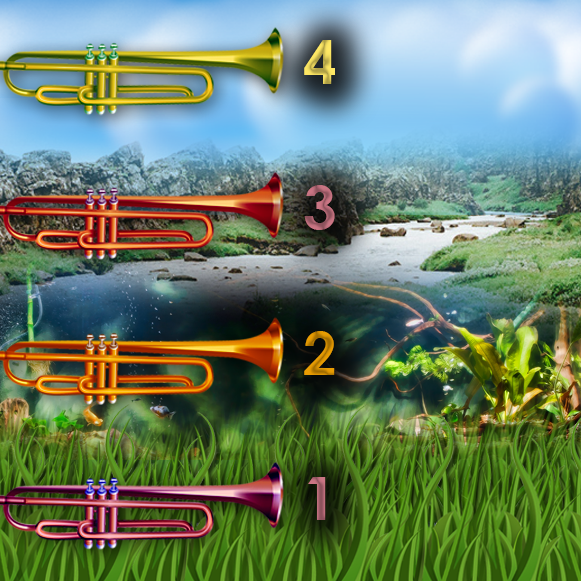 Don’t get too involved in the details of the first four trumpet disasters. The descriptions present us with vivid pictures intended to evoke emotion rather than convey specific detail. Hail mixed with fire, mountains thrown into the sea, and flaming stars might have some particular significance but serve mainly to create a dramatic image that cannot be ignored. The first trumpet warning concerns the earth’s vegetation and we, more than any generation before us, are witnessing the mass destruction of vast areas of forests and grasslands. The decimation of the Brazilian rain forests first caught the public’s attention, but habitat destruction is far more widespread than that. We are all painfully aware of what is happening in the world around us but what some folk might not realise is that when we destroy an ecology we doom multiple species of animal life to extinction. The second trumpet has to do with the oceans of the world. We have fished out vast expanses of ocean, destroyed coral reefs, poured billions of cubic meters of effluent into every ocean that can be named, and slaughtered whales and dolphins to near extinction! For the last several decades’ world leaders should have been responding to the escalating destruction of our planet, but they haven’t! Now it is too late for conferences, and research grants, and pro-green rallies. The trumpet has been sounding but our ears have been too blocked by materialistic greed to hear. The next warning concerns the river systems of the world. I need look no further than my own country, South Africa, to see the systematic pollution of rivers that has been taking place. Factories spew toxic waste into what were once pristine rivers, abattoirs pump a flood of blood and offal into the nearest tributary, mine acid seeps into the water table … and the list of woes goes on and on. The fourth trumpet sounds a warning that we are destroying our atmosphere. Carbon emissions have formed a hot-blanket around the planet and temperatures are rising, and with this global warming comes devastating weather changes. In the space of the last two weeks I have personally experienced a hail storm of biblical proportions and, just 100 kilometers away a sand storm where the top soil of some of our best farmlands was ripped off the drought-stricken ground by tornado like winds. Further, we should encourage those who do not have a relationship with Jesus to turn to Him and cry out for salvation – for then the trumpet warnings will have served their ultimate purpose. Destructive as these warnings are they do not match the woes that follow… so buckle up and brace yourself for the next post. Hi Chris, this revelation is so new to me. We have so much to answer for, we have neglected caring for the beautiful world God created for us. This post comes at an apposite time as world leaders sit this week in Paris to discuss climate change! Thank you Chris!